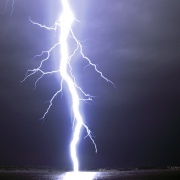 Great, huge lightning discharge electricity, unimaginable by any mind, is also the very most relevant cause of any damaged, weakened crop found anywhere in the world. 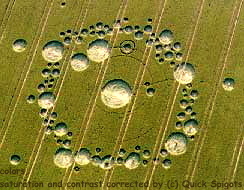 That is much more interesting and important fact than any Crop Circles found as yet. The time, elapsed between the discharge and crop circle really appearing - bending (damaging, weakening) became visible - varies from several days to many weeks (!!! ), maybe more months. One of the main reasons why the sole culprit still escapes and was never detected. Process very similar to chemical development of silver photos. Weakening of stalks, caused through electricity from lightning, may be ongoing many weeks, before bending of the stalks to the ground occurs. Often due to the domino effect, bending, inclination of the stalks towards ground surface, process may last only minutes. Butterfly effect may also take place. Early morning dew,rain, possible reason of really short-time increase in 50 - 100% stalk weight, several g/plant, maybe more than 40 tons/ha, depending on the crop type. GPS - tens of meters, time - nanoseconds, polarity, type, peak current - kiloamperes. The most shocking message to any hitherto crop circles observer: Almost every downed, bent, inclined, declined, damaged, weakened cereals in the world are lying on the ground only and only thanks to the electricity from lightning. Accompanying photos are only just a tiny sample from a collection of more than 10 thousand photos. Most of them were acquired on the exact points, where were objectively determined, electronically measured and calculated GPS locations, exact time in nanoseconds, intensity (thousands of amperes) of lightning, polarity. Also type - cloud to cloud (CC), cloud to ground (CG). That of type cloud to cloud were omitted, because subject of research were lightning hits into ground, into crop fields. They were collected during a number of years. 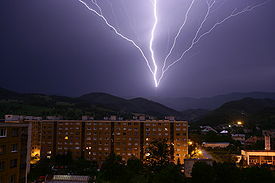 On many of described locations, after localization of the lightning were made research and photographs more than ten times. Thanks to that was the chronology of cereals damage very thoroughly documented on named places. Almost every time observed, although with some rare exceptions, certainly, that it takes several days, before the stalks completely bend, put down to the ground. Sometime several weeks. Sometime more than two months. 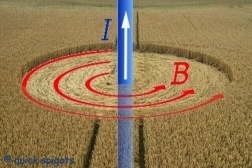 The same happening during crop circles origin. Never, never, never any unknown, incomprehensible force. Only weakening of stalks, and effect of their own weight. 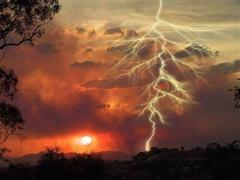 In some places, the photographs were taken several days after the lightning has been identified there. But still without the slightest signs of weakening or damage of plants. Although the process of weakening of the stalks may take many days or weeks, the emergence of shape, which are shown in the accompanying photos, may be only a matter of minutes or hours. See the domino effect, chronology. The so-called forgeries are only a very small percentage, within statistical errors, but rather far below its levels. Shots are as a reminder and an effort to pay homage to the largest and most important manufacturer of photographic materials, that existed ever, styled to a film strip of Kodak slides. By the way, farmers know very well, all the effects of lightning discharges into their corn fields during the growing season. Also with any other plants. Sugar beets, potatoes, tomatoes, cotton or other. Agricultural science and scientists pay them attention in dozens and dozens of articles and scientific publications, as will be described later in more detail on some subpage. 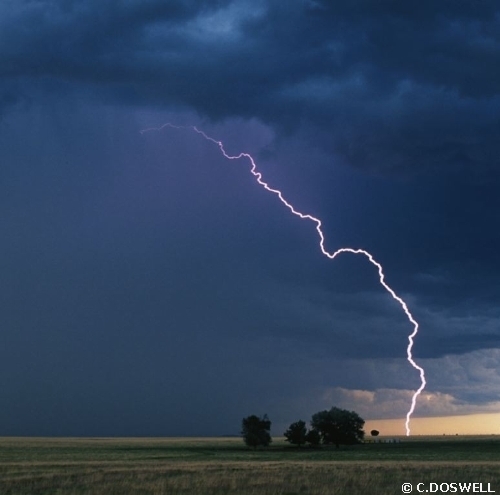 They know very well that very often after lightning discharge into the field is after some time created a circle, damaged, weakened, poorly growing or completely destroyed plants. Just only ask. The fact that farmers similar informations from Junk science admirers until the present time very successfully concealed, can be regarded as very well done joke. It certainly was a much more pleasant approach than if they kicked their sciolism asses. They have made of them actually fun all the time, along with Mother Nature. From the pitiful audience, drugged by the mysteriousness of the phenomenon. But it is quite logical, because admirers of UFO, psychotronic, mystery and unknown energy, cosmic and intergalactic, messages from universe, mental energy and processes, have never been interested in similar objective informations. There is no need, for such a fools, to get acquainted with scientific literature. They all over the decades apparently with any scientific or technical information, let alone a book, did not come into contact at all. Uneducated men who for any expert advice apparently did not care at all, and still only paid interest to their ufo-tele-para-psycho-kine-teri-logi-pati-eso-extra-senzo-inter-gala-terre-stela-super-natu-kvazi-tera-giga-mega-ultra-infra-macro-micro-nano delusions and nonsense. Serves them right. The vast majority of individuals, who were ever like wannabe, pseudo, "professionally" interested themselves in crop circles problematics, in fact only parasitize on the fact that the whole matter is very difficult to explain. They were mostly parasites, nothing else. A similarity purely coincidental... of the crop circles creation. Again and again, will be continually emphasised: The creation of crop circles, but also any pattern of damaged cereals, even if completely irregular, process extremely reminds traditional photography and film, based on silver halide gelatine emulsions. After exposure at first arise latent, invisible images. Similarity # 1 - raster of plants in the field of grain acts as a photo-sensitive layer, recording a latent image. The shape is recorded as a recording of electromagnetic field lines. The same like photographic recording. Developing - chemical, biological and physical changes, caused by the electricity, that lead to the weakening of stalks. The process may be really very slow, may last days or weeks, or even more than month. After some time they are so weakened that they are not able to hold their own weight, and bend to the ground. All this without any action of any other force, effect, or other phenomenon. Incomprehensible, unknown, inexplicable, supernatural. But in some rather exceptional cases, the pattern can occur almost immediately after a thunderstorm and lightning discharges, and thus resembles Polaroid. 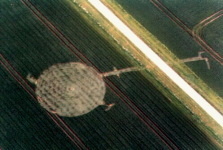 After developing the crop circle picture became visible. Similarity # 2 - stored images are visualised through successive slow (bio)chemical and physical processes. Similar to developer and fixer in a photographic darkroom. crop circles picture is created, recorded, during the lightning discharge, resembling photographic flash. Let's say, the energy impacting upon the sensitive layer maybe 1018 higher, ie 10 raised to a power 18, ie 1 followed by zero 18 times. Similarity # 3 - the image is recorded with the help of flash. Alike - photo - flash. Comparison of images that were displayed in the field with the help of natural developer, is possible find in some publications or articles that deal with aerial archeology. For example Leo Deuel - Flights into yesterday: the story of aerial archeology, St. Martin's Press, 1969, ISBN 9780356031521, p. 38: "In this way, vegetation acts in somewhat the manner of a chemical developer of exposed photographic plates: it throws up the latent pictures." Author likely to use a quote of some pioneer in this field, perhaps even Crawford himself. It can be inferred from used expression "photographic plates" that were used much more in 1922, when Crawford and his successors carried out their first investigations, than in the sixties, when Deuel gathered materials for his publication. Aerial archeology is a true, classical scientific research discipline (see). Unlike all previous very dubious theories about the origin of crop circles, that operate mostly with aliens, microwave radiation, UFOs, ETs, flying saucers, messages from The Universe or many more similar or much worse nonsense (stoned wallabies, hedgehogs). Any messages about crop circles until now were only "Much ado about nothing"
Lightning discharges are also the only reason of every lying down, bent, damaged, weakened crop in the world, round whole globe. Estimation more 60-70%, some localities more 90%, or really the only one cause in the world. Say, much more 90%, with exception hurricanes, tornadoes, floods, really rare, anomalous, severe exposure. 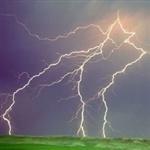 Lightning is one of the most extreme phenomenon in hydrometeorological observations. It looks, that maybe round last 40 years, also many earlier, the NATURE was only joking. It was one of the greatest joke ever made, and whole mankind, Homo Sapiens, were acting only like dummies, puppets, helpers or something like that. Really vicious circle. In crop. Crop circle joke. But was. Crop circles. It was one of the greatest joke, great theatrical performance, or film show, from our own NATURE ever made, and whole mankind, also many animals and plants acted as players, figurants, dummy, puppets, marionettes, clowns, augusts, jokers and goblins or something like that, in hidden camera program, lasting more than 30 - 40 years. Crowds: dowsing persons, UFOlogists, fortune tellers, flying saucers, UFO and aliens believers, telepaths, rain doctors, voodoo individuals, magi, meta psychologists, astrologist, mystics, occultists, paranormal believers, thought force believers, thinking transfer believers, and many other pseudoscience and alternative science "specialists". Above all, it must be emphasized, that the explanation shown here, or any page of this website, in any case does not deal with concepts or fields of human activities such as Paranormal phenomena, Ufology. Belief in aliens, Extraterrestrial life, Unidentified flying object, Military disc-shaped aircraft, Flying saucer, Supernatural phenomena, Pseudoscience. Immediately followed by extremely strong mechanic pulse, that propagates at first supersonic - shockwave, sonic - sound, and subsonic - blast wave, also a litle, locally observable earthquakes. Also followed by electrostatic, electromagnetic effects - light velocity, and secondary electromechanic and electromagnetic waves, distributed by induction in stalks and leafs, conductivity between plants touching each other, also conductivity of ionized air, ionised air humidity and earth surface. Also a little difficult to define sequential charge and spark jumps between entities, including electrochemical transfer, and great, enormous interferences and resonances between all that. In some cases also possible to find, and measure monumental rotating electromagnetic field. More than 99,9% crop circles found, and also much more of that never found, in the world yearly are genuine, not manmade. Mentioned crop circles were created by real nature, really huge mechanic, electrostatic and electromagnetic forces and very high, also huge electric tensions and currents, during lightning discharge. Also some short time before and after. Any of them were really monstrous, extremely strong, beyond any imagination. Also in named crop circles sites appeared classic currents conduction in air, soil, stalks, roots, leafs and electrolysis there. They were all huge, too. Also in named crop circles sites appeared pyrolysis, high voltage dissociation of vapours, liquids and solids, thermal decomposition and similar changes. There in named crop circle sites may be in progress huge interferences and resonances between all named forces, too, and between parallel strikes and subsequent strikes - restrikes, that were in progress there, and all electromagnetic beams and mechanic effects created by that. There are many pipes underground - waterpipes, electricity, gas, drainages, sewerage. Possible, that great part of lightning currents are conducted near some of that lines, and after that may appear on the surface of the field strips of lying, damaged or dead cereals. Possible, that such crop lines are completely dead. Such strips may appear in cereal fields even much more often, than any other regular patterns of crop circles, that were anytime found. Any such strip, even if near crop circles, are absolutely out of focus of any crop circles observer. The stripes of cereal lying above underground pipes are the sole cereal shapes, that is possible predict in future. Possible to find many of such strips in many air photos. There will be whole page lines. Such long lines often appear near, also inside of some crop circles. Many photos available, some of them pass through them. Also many quite isolated lines of damaged or completely dead cereals, may appear near or in any irregular shape. Not only lines, but also some more complex, sometime very complex structures. That is the only shape which occurrence, especially very precise position, it can quite successfully predict the future. Its occurrence may be able to detect a large number of aerial photos from the past. Alone, no special lines lying damaged grain may occur in the vicinity or within completely irregular shapes. Of course, arise only when in close proximity lightning hits. But if that happens, surely arise. Incurred by certain, it can be very substantial, part of the discharge energy passes over any underground pipes or occurring network. Any engineering network, it can also be a ceramic, concrete or plastic underground drain. Around them is always concentrated higher humidity. 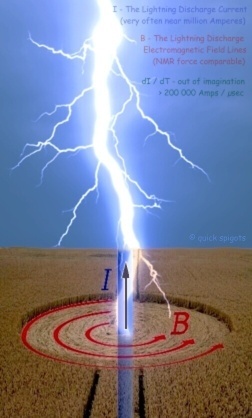 Residual energy of the lightning discharge, which passes over any underground structures, partly affects the root systems of plants located above them, and there is a series of subsequent events, as described on the page chronology. Electrochemistry, chemistry, biology, physiology, pathology. Plants damaged and weakened by the passage of electrical energy are easier targets for any pest. Period of several days or even weeks, and plants in the line of exactly replicating the direction of the underground lines, bend the stalks to the ground, or die completely. This may of course occur in different time periods, if the affected underground lines exceeds the borders of several fields, due to different local conditions and differences in the resistance of cultivated crops above it. See Opočno. 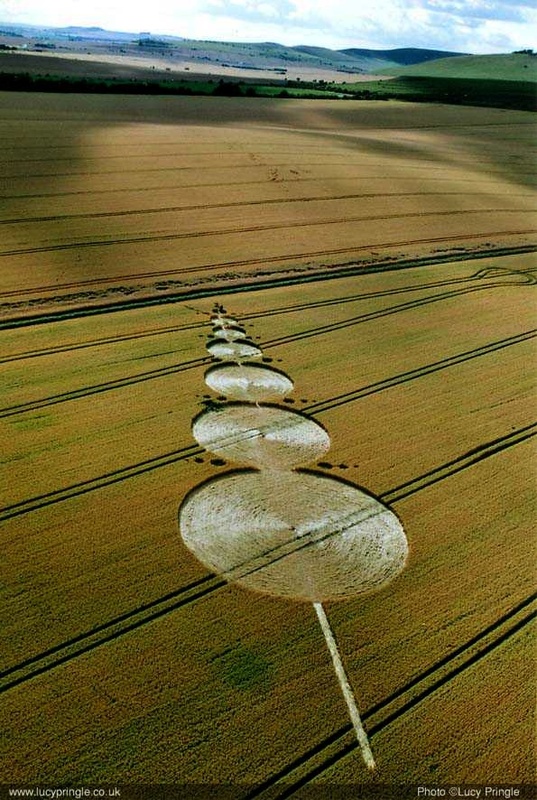 Possible, that such straight lines are parts of many crop circles, found in past. Plans of underground services exist and are to trace. Under the surface of many cereal fields there are drainage systems. Underground there are also natural water flows and humidity. The lines, or some more complex shapes, may also appear above some archeological structures. Landscape architecture could result in even more complex shapes. Of course also circles, for instance above places where was water well, roundel, threshing floor, garden little lake. Thanks to chronology, during days, or weeks, may cereals above such lines gradually weaken and bend to the surface, or, also very often, completely wither away and die back. Even if they are found near almost any crop circles, they are really completely out of attention of any Crop Circle observer. Also possible, that such lines are passing through more than one field with cereals, sometime many. See Opočno. 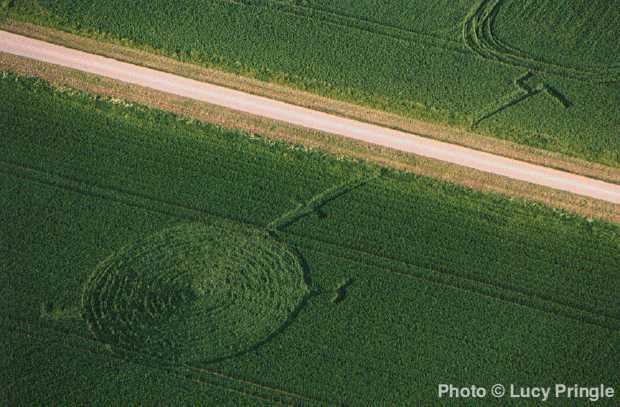 It would probably be possible to find many other photos of crop circles that contain more straight line shapes. Some of them, or straight lines connecting the centers of the circles, would be identified with pipelines, electricity, data, materials, water, waste, ie all utility lines. In addition, most frequently occurring below the fields surface - drainages and dewatering channels situated underground. More attention to described phenomena will be paid on some other pages - straight lines of damaged cereals, where will be concentrated many other crop circles photographs of of observers from previous years.